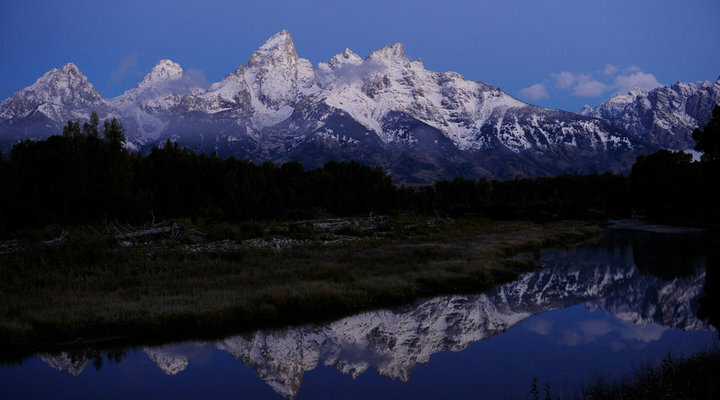 Using a wide-angle lens you can include more than one mountain peak in a photo. Here the mountains are reflected into the water. In this landscape where the log cabin in the foreground, as well as the high grasses are in sharp focus. The mountains are also relatively sharp, due to the use of a small aperture, which allows for the depth-of-field needed to keep the background from blurring. Inclement weather isn't a reason to stay inside. Even though most of this mountain range is hidden, the photographer was still able to take a photo of the visible peaks. This photo was captured at sunrise. The sunlight is just hitting the peaks of the mountains because it has not yet risen fully in the sky. Camera placement: the sun is rising behind the photographer. Here the boats and their reflections in the water are the main subjects, and the mountains, partially obscured in fog, take on the role of background. People have always been fascinated by imagery of mountains. Artists have been drawn to them (pun intended) over the centuries, and photographers like Ansel Adams focused on their jagged peaks from the early days of photography. Mountains are even included in the words to "America the Beautiful." So how can we make the most of these "purple mountain majesties" in our photos today? The first and most important rule is to make sure that the horizon line in your photograph is straight. If you're hand holding your camera, take care when looking through the viewfinder (or on the LCD if you're composing that way) to make sure that the horizon is straight, not slanted. Sometimes you can fix a crooked horizon line with software, after you've taken the photograph, but doing so may also mean you'll have to crop out part of your picture. If you are using a tripod, that's even easier. Many tripods have a built-in bubble level that will show you whether or not the camera is straight. Some Nikon cameras incorporate our Virtual Horizon feature which quickly and accurately displays a graphic on the LCD to show the camera's position relative to the actual horizon. This is an invaluable photographic tool when shooting landscapes and architecture. No more guessing if the horizon in your scene is level. You don't have to be particularly close to a mountain to make a nice photo. In fact, you'll often be many, many miles away. The only truly limiting factor then is how clear the air is. If there's haze, pollution or fog, the mountains may be too obscured to see clearly. As long as you can see the mountains, though, you can photograph them. Mist, rain, haze and snow can enhance an image, where the weather becomes an important subject along with the towering peaks. Sunlight can break through an overcast sky, showing a small portion of the mountains behind the clouds, making a unique photographic opportunity. And, when the sky is filled with haze, you can sometimes make photographs of the mountain range that resembles layers of peaks and valleys repeating in the distance. Photographing mountains from down in the valley will allow you to include near objects as framing elements. For example, a tree with overhanging branches can frame the distant mountain peaks, will make the photograph more interesting. Other foreground subjects can be flowers, a road leading towards the distant mountains, herds of grazing wildlife; even an old barn, cowboy, or boats on a lake. When photographing this scene, you're using the mountains as a backdrop for something else. That helps gives some context to the main subject (which is in the foreground). Whatever it is, though, the mountains add not just another interesting visual element, but some sense of location and scale as well. As long as you can see the mountains you can photograph them. Mist, rain, haze and snow can enhance an image, where the weather becomes an important subject along with the towering peaks. The road draws your eye into the photograph; finally you're brought to the mountains in the background. This photo is an example of mountains taking on the role of backdrop. The reeds are the main subject, and the mountains are out of focus in the distance. In this photo, the mountains are again the background, but they are not as sharp as the main subject, the man riding the horse. This is due to the use of a larger aperture, which provided less depth-of-field, and so the background is not as sharp. If there's water in the foreground, and if it is still (not moving), you can include the mountain's reflection in the water into your picture. If you come upon a lake and the water is choppy, you won't be able to capture the reflection clearly, so try again the following day. If you can, head out shortly after sunrise (or even get up early and photograph the sunrise), when there is no wind, and the water's surface will be flat. Normally photographers try to avoid placing the horizon line in the center of the frame, but this is an instance where you can go ahead and break that rule. By placing the horizon line in the center of the frame, the photo becomes symmetric (bisecting the frame into two equal parts). Experiment with your composition and move the horizon line. Try composing the photo so only the reflection is in the frame; or compose a picture with only a small amount of surrounding land in the frame. Taking photos at "first light," (sunrise) or at sunset will give your images more vibrant colors. The light in early morning will be cooler (blues and/or violets), whereas the light at the end of the day often will be warmer (reds and/or yellows). If you are lucky enough to have a mountain range close to where you live, you could even try taking pictures of them at different times of the day, or even different times of the year, to capture the changing seasons. Include foliage or a body of water and its reflection in the images. And, photographing the rising or setting sun in your photograph will give you a different look than if you have the rising or setting sun at your back. You can also affect the color of your images by experimenting with the white balance settings on your camera. While cameras often are set at "Auto" white balance, if you choose Incandescent or Fluorescent, the colors will look cooler, while Cloudy and Shady will make them warmer. Experimenting with white balance can lead to unique images. Here this silhouette with the crescent moon was photographed with the camera's White Balance set to Shade, which causes the sky to be a warm orange. Experimenting with white balance can lead to unique images. Here this silhouette with the crescent moon was photographed with the camera's White Balance set to Fluorescent, which causes the sky to be a cool blue. Don't just photograph a mountain or mountain range from down in the valley. If there's a ski lift or gondola that takes tourists to the top of the mountain, you might want to ride to the top and photograph the mountain from the peak, looking down, for a different view. However you photograph them, mountains almost always make a great subject or background for your images. To see more of Reed Hoffmann's photography, visit his website at http://reedhoffmann.com. Over 25 years ago, Reed started in studios, then worked at newspapers, and now freelances out of Kansas City. He has been shooting digital since 1996 and teaching digital photography since 2000. Nationally recognized as an expert on digital photography, Reed has helped over 30 U.S. and Asian news organizations ease their transition to digital. He is also a founding member of Blue Pixel, a major digital imaging consulting firm.